Donald Trump shouldn't be able to nominate the justice who will decide the fate of his presidency. Under the present circumstances, in fact, the Senate should not even consider holding confirmation hearings any time soon. Our objections don't stem from Kavanaugh’s credentials nor his likely rulings on hot-button issues that divide the American public, such as reproductive rights, voting rights and marriage equality. Rather, the reason that his confirmation hearings must be postponed is much more fundamental: No president should nominate any Supreme Court justice while he is under criminal investigation and facing the prospect of impeachment proceedings. Impeaching Trump won't fix this crisis. America desperately needs a political reset. 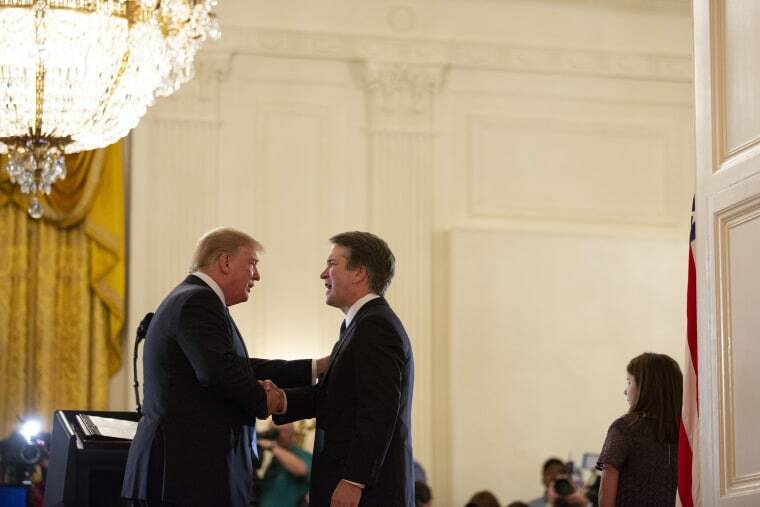 In the near future, the Supreme Court may well be called upon to decide several questions that could affect Trump’s political future and even personal liberty. For the first time in American history, staffers of the president’s campaign are under investigation and several currently face or already pled guilty to charges of lying to the federal law enforcement over contacts with the Russian government or money laundering. The main criminal investigation, which was turned over to Special Counsel Robert Mueller on May 17, 2017, involves "any links and/or coordination between the Russian government and individuals associated with the campaign of President Donald Trump" and "any matters that arose or may arise directly from the investigation," but is widely believed to also include examinations into any obstruction of justice related to Trump's firing of then-FBI Director James Comey and the infamously opaque financial dealings of the Trump Organization. In 1610, the legendary English jurist Sir Edward Coke wrote “aliquis non debet esse Judex in propria causa” — no person should be a judge in his own case. By the same token, no president facing outstanding legal jeopardy should be able to appoint a potentially tie-breaking Supreme Court vote that might affect his own potential prosecution or impeachment. If Trump Tries to Pardon Mueller Targets, Can Anyone Stop Him? Finally, if Congress did vote to impeach and remove him from office, but he refused to leave the White House, the Supreme Court could well be asked to weigh in on the impeachment. The court ruled in 1993 that it cannot interfere in congressional impeachment proceedings, but in a recent book, Trump defender Alan Dershowitz called it an open question. Only the dangerously naïve would think that Trump did not consider these questions as part of his nominee vetting process. His Supreme Court vetting team closely examined Kavanaugh’s past writings on these issues, as they would have on a variety of issues before nominating him. In a 2009 law review article, Kavanaugh argued that “[t]he indictment and trial of a sitting President... would cripple the federal government” and “[e]ven the lesser burdens of a criminal investigation — including preparing for questioning by criminal investigators — are time-consuming and distracting.” That must be music to Trump’s ears. Under these circumstances, the Senate must not confirm a judge — any judge — to a life-tenured position on the Supreme Court. If Justice Kennedy had remained on the court, then his votes on these issues would have at least had some legitimacy; after all, Kennedy joined it in 1988, long before Trump became president. But now that Kennedy has retired, the country cannot afford the prospect of Trump personally selecting the justice who may decide critical questions that could end his presidency, or allow it to continue in the face of what would otherwise be criminal or impeachment proceedings. No past president facing criminal investigation or impeachment proceedings has appointed a Supreme Court justice in these circumstances. President Richard Nixon appointed four new justices to the court, but all were sworn in long before the Watergate break-in. President Bill Clinton also appointed two justices, but both took their seats before Monica Lewinsky even began her White House internship. The Senate Judiciary Committee should postpone confirmation hearings for any new justice until Special Counsel Robert Mueller and other federal prosecutors investigating the president and his businesses have completed their investigations, and Congress has begun and concluded any impeachment proceedings. Only then will the American public be assured that the new justice is not tainted by Trump’s desire to protect himself from criminal and other legal proceedings that may come before the court. Tom Steyer launched need the Need to Impeach campaign in October 2017. Ron Fein is the legal director of Free Speech For People and a co-author of the forthcoming book "The Constitution Demands It: The Case for the Impeachment of Donald Trump,"which will be published by Melville House in August 2018. Tom Steyer launched need the Need to Impeach campaign in October 2017. Ron Fein is the legal director of Free Speech For People and a co-author of the forthcoming book "The Constitution Demands It: The Case for the Impeachment of Donald Trump," which will be published by Melville House in August 2018.